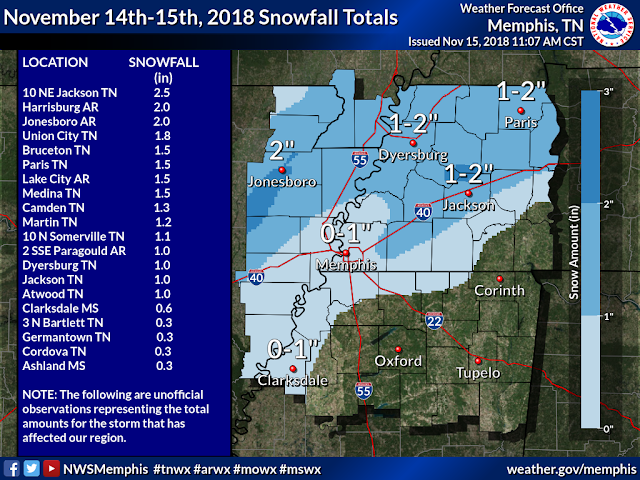 The first winter weather event of the 2018-2019 season occurred on Wednesday as a potent upper level low moved over the Mid-South. Snowfall totals pretty well lined up with projections, as shown by the graphic and snow totals list below. The heaviest precipitation occurred over northwest TN and northeast AR, while the immediate metro saw amounts from 1/4-3/4" of snow that melted away on Thursday. The 0.6" at Memphis International Airport was the greatest November snow total since November 7, 1991. AMOUNTS AMOUNTS FOR THE STORM THAT HAS BEEN AFFECTING OUR REGION. Looking ahead to Thanksgiving week, a generally drier and more seasonal pattern takes over. The main precipitation concern is scattered showers mainly during the night on Sunday into Monday. Thanksgiving should be dry and pleasant for walking off all those calories! Black Friday shoppers won't freeze at Friday morning doorbusters, with moderate temperatures into the holiday weekend. The dry pattern could slip away though with rain projected next weekend. 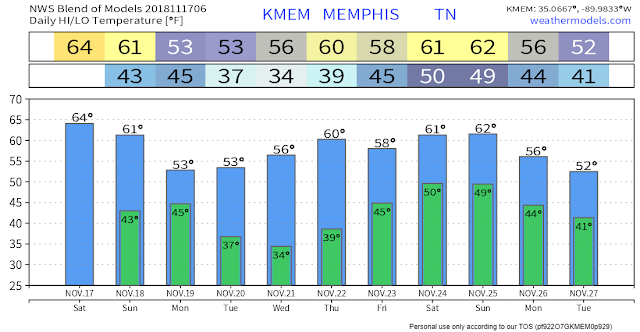 The National Blend of Models temperature output for Memphis for the coming 10 days features generally seasonal conditions.